Crafted by Adrian Frutiger, in the year 1988, Avenir™ is a reflection of love one can have for impressive sans serif typefaces. It can also be referred to as an obligation towards designing a linear sans keeping with the ongoing tradition of Erbar and Futura. However, the creation was such that the modern century can use it with same effect. 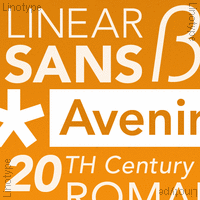 Derived from the French word “future”, Avenir is more than a geometric design. Avenir promises a pleasant and sagacious appearance for texts and headlines.